It's such a low percentage of CHLers that go the route that you're implying, it's hardly worth your breath to imply that it's a problem. Before the 4 years are up on your college prospect, you may have already reached conclusion on your CHLer. That's the benefit. Your conclusion may turn out be wrong, but you have adequate time to ascertain that. It's not 2 years of a CHLer, it's four by the time you finally get your hands on the college player for his 1st yr evaluation. I am not saying there is a problem there, I was more implying that there isn't a problem with college hockey. Just because one guy refused to sign and ruin his career and go to Edmonton doesn't mean there is a problem. As far as the development side of it goes, every player is different. I think going the college route was the best decision for a guy like Gaudreau. If he went the CHL and played 70-90 games it probably would have taken its toll and worn him out especially at his size. College with its lighter schedule allows him to work out more and get bigger, while still getting top end coaching and playing against top end talent. Also players can leave college whenever they want, most players that stay the full 4 years do it, either because they feel they aren't ready for pro hockey and need more development time or they want their degree. It's not a problem at the moment because US colleges were not producing high end talent but as hockey develops in the States, it will become a problem eventually. Statistically, there are now more kids in organized hockey in the USA than in Canada. It's just a matter of time before increasingly more talented kids go the college route and NHL teams lose their rights. The thing with CHL is, they have to re-enter the draft and their destiny is up in the air. With College, they finish College and sign as a free agent anywhere that has interest in them. I wasn't aware Development camps were not considered training & that that they run for free? Who pays the Flames Staff for their time? Facility costs, Coaches, trainers, medical & dome staff, room & board? The Staff & costs go on & on just for one event. Not to mention Teams spend time & money all year long scouting & keeping up to date profiles on all their prospects. Just because most of it is done as a group doesn't discount the Time & money invested in each of these prospects. The players have to get to Calgary on their dime after that the Flames are flipping the bill. We bear the same costs if we invite a player on a tryout contract. With the TOC it's a cheap look see. With players we have the rights to (college or junior) it's a chance to monitor progress & suggest things to work on (weak areas of their game, nutrition or strength excercises). The cost is minimal if the TOC results in a player or the advice means a better player in a few years. Of the top ten scorers in the NHL as of today 3 of them played college hockey while 5 players played CHL. To say that college hockey hasn't been producing top end talent is just wrong. Those players that want to become UFA's have to wait 4 years to do so and then they still have to sign an entry level deal if they do. Just a question other than Justin Schultz who has opted not to sign with the team that drafted them and become a free agent? I read an article earlier in the year about a lot of former NHLers now iving in the states advising their sons to go the college route rather then CHL. It happened to a small degree before but seems to be more popular now. OK so Blake Wheeler and Justin Schultz went that route does that mean that we should stay clear of drafting any and all college players? We will missing out on a lot of top talent if that is the case. This isn't directed at you per say flyerfan you were just the one who answered my question. It isn't saying avoid college players at all costs, but certainly give preference at this moment in time. To portray it as a 30% vs %50 NCAA vs CHL ratio question begs names. It isn't close to that in leadership, but you're portraying it as such. So, yeah, it screams out for names. No worries. I just answered with the 1st player that popped into my mind. BTW, he was drafted by the Coyotes @ a time their future was in grave doubt so there were extenuating circumstances. If you want some that didn't use the loophole just think of Johnny Toews. CHL players have refused to sign with the team that drafted them. Eric Lindros is the most prominent example (he told Quebec not to bother drafting him as he would never play for them) but Mario Lemieux refused to go to the podium for the traditional pulling on the jersey & wearing the hat when the Pens drafted him. When the Pens gave in to his demands he signed. Of coarse it does, anyone taking part in Development camp bears the same cost to the organization. My point was that NHL teams should reap the rewards of investing their money, time & training on their prospects with out fear of them following the Justin Schultz model. I don't agree with those saying there is no cost to the Flames for drafting a player like Gaudreau. It costs us a draft pick. It costs us a spot at the development camps. It costs us time keeping tabs on the player and family. He fills a spot on our development chart and this influences decisions on further team development and player acquisition. I don't blame the player. As long as the player is honest and ethical with the team about his intentions than I don't think the player should have any moral obligation to the club. He is just operating within the rules. But I do think the rules should bind a player to the team. If you draft a player you should have first right to the Entry Level Contract if that player decides to play in the NHL. There needs to be an out if the club decides not to sign the player. But when you have silliness like the Schultz public sweepstakes for an EL player that is bad for the game. Plus nobody believes there wasn't tampering in the Erixon debacle. It isn't fair to the teams, and it isn't fair to the fans that follow these prospects for years. At a minimum, if the NCAA would allow teams to sign the player to a preemptive ELC that begins as soon as the prospect leaves school that would be better for both the player and the team. No pressure on the player to sign and the club has the assurance of a signed contract. At least that would bring it inline with the CHL. NCAA players may be invited but pay their way. Any form of subsidy would forfeit their eligibility. Other invites have their way paid. Small point, but NCAA players are not really part of the development play until they decide to come. There is no pressure for them to come. Fair points. The Flames don't pour money specifically into Gaudreau's development but they do spend a small portion of their total budget to keep an eye on his progress. I'm not a fan of the college route and i hope they change that in the next CBA. Teams are exposed almost as worst as drafting Russian kids who later decide to play in the KHL instead of the NHL. While I agree with this statement, it applies to 3-4th liners, as opposed to Russians that are generally in the mix as your best players. This NCAA argument will go on for years yet, before you can qualify some great NHLers coming out of college, rather than being CHLers or Russian/Scandinavian. It definitely isn't there now, yet here we are all hearts and flowers for college prospects. That part makes no sense to me. The Gaudreau argument from JTECH doesn't add up for me either, as much as I enjoy JTECH's common sense usually. That Gaudreau's college choice is good because he would have gotten killed in the CHL as a 18-19 yo. He's further along in his development, so is everybody else that might have been a concern 3 years ago, lest they were replaced by even craftier players. My point is to completely level everyone's Gaudreau expectations and exultations. Consider if Connor MacDavid suddenly exclaimed, "I'm going to Yale". Gaudreau is extremely far away from walking in here on college accolades and taking over, as it were. If I had a genie's lamp, my 3rd wish would be Flames fans would relent on prospect pressure....after the money and chicks wishes, of course...I'm shallow like that! I think that players going to the college route shouldn't be drafted or available to the draft, much like basketball. They declare their draft eligibility and then can enter the draft. So, Gaudreau wouldn't have been drafted yet and also wouldn't be allowed to choose exactly who he'd go to if he were to finish his college career. He would declare his draft eligible status and then teams could draft him from there. Stiff competition, from an acedemics perspective. Johnny Hockey wins it hockey-wise hands down. It'll be super lame if Johnny doesn't win this thing. He's clearly the superior player of the three. Also, it'll be less likely he goes back next season to try again. Well it sounds like the BB maybe the excuse with the possibility of him not signing. Dad seems uncomfortable with BB public issue of wanting to get bigger. The comment of the parents more comfortable with Feaster looking after the kid, seems to be a sign of entitlement he may have gotten. It's more like having a boss who knows your work and thinks highly of you. You don't have to go out of your way to prove yourself on a daily basis. All of a sudden, your boss is fired and a loud-mouth boss comes in and says "prove it". Burke has fans and haters. JH's dad probably doesn't like the reference to "bigger". But he does want his son to make the NHL, if that is his goal. Calgary presents the best opportunity right now. Rebuild. Some smaller players showing success, but enough roster turnover to have a good chance of making the team from camp. JH has never had any problems proving it every day. Same way St. Louis is. That is the reality of the NHL; you have to prove yourself. When you are 5'10" and under you are going to have to prove yourself in the NHL no matter what team you play for. There have been a few smaller players that have had tremendous success in the NHL, but there have been more that can't cut it. If you have two players who produce 30 points a year one is 6'2" and the other is 5'9". The 6'2" player is going to get more opportunities because size matters in the NHL. Burke has always made room on his teams for skilled players in the top 6 regardless of size. He drafted Kadri and traded for Kessel neither are very big. Gaudreau will be given a chance if he signs, but I think Burke will want him to start in AHL to get more comfortable with pro hockey, and I agree 100% with that decision. There is no reason to rush this kid to the NHL. I would point to Gustav Nyquist as a good example on how to bring along a prospect. Nyquist is a very skilled college player who lead the nation in scoring his last season in NCAA. Detroit played him in the AHL for 2.5 seasons and now look at what he is doing, 28 goals in 50 games last time I looked. If Gaudreau comes into camp and pre-season and does what Monahan did in 2013/14, how do you send him back to the AHL? There was a (length) debate about Mony going back to junior, so I would expect a similar debate on this. There are some players that transcend the development leagues, and playing them there is pointless. There are a few players that could make the Flames next year, depending on their camps. I try to and tend to be a glass half full guy. I found this nice sounding tidbit from from his dad in that article. 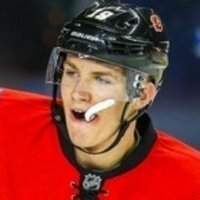 As a hockey person that knows the game, it would be better for him if he wanted to eventually make the NHL to go sign with Calgary." Anyone see the answer in this quote to the million dollar question being asked around here? Do you see him saying anything like he would prefer to stay in the east? While you guys are busy scrutinizing an medias for things to show he is going to jump ship elsewhere, instead of signing here when he is ready to come to the NHL, this indicates his real decision is if he will play one more year with his brother or sign here. That also is a slap in the face to those who feel we should trade his rights if he doesn't sign after this present hockey season. So who is creating all this hype over his supposed not going to sign with the Flames and jump ship to another team???????? Monahan had a very pro style game coming into camp so that made his transition easier. I am not sure the same can be said about Gaudreau. If Gaudreau comes into camp and puts up points but is getting pushed around a lot, I would still send him down to the AHL to get used to the speed of pro hockey. What allows a guy like St. Louis to be successful is that he is very strong in his core and his legs making him harder to knock off the puck. Gaudreau looks like he needs to really add that strength and until he does I can see him struggling in the NHL. I just don't see him being ready to step into the NHL right away, I think time in the AHL is needed with this player and that isn't a bad thing. The guy hasn't even got to the 1st Frozen Four game yet, and everyone is talking about his future. Right now, the only thing he wants is the Hobey and the NCAA Championship (as a sendoff to his line-mates and something to share with his bro). He was mad that he was at the Hobey event last year, but his team didn't get to the Frozen Four final. Regardless of his parents' opinions, he will make his own decisions. He will probably make a decision shortly after the Hobey/Frozen 4 is done. Probably will talk to his brother first. I think he also hopes that Arnold is inked first. Burke hasn't been able to talk to the family advisor or the parents yet to clarify or state his position as he took over during the season, I'm thinking the family is posturing a bit, I'm confident he signs at the end of the season. I'm assuming when the article says Calgary is putting pressure on Jonny he's referring to the media/fan base. I thought he was the best player on the ice during training camp even better then Monahan, they seemed to have really good chemisry & I remember their interviews both saying they felt really confidant playing together. My prediction is he signs & spends the summer in Calgary getting proper training & makes the team out of camp.